I have been busy lately and this is my first post after Chinese New Year. I thought I’d start with something simple. This is my own recipe. This bread is lovely for breakfast. 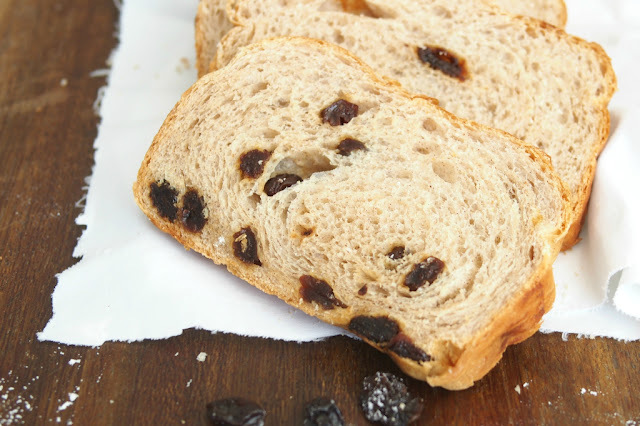 It comes out with a soft texture and you can eat this without jam or butter as the raisins gives it all the sweetness it needs. I like to use skimmed milk powder instead of fresh milk. As we do not drink milk daily in our household we don’t usually have fresh milk in our fridge. If you do wish to use fresh milk, just reduce the warm water amount (200 ml milk and 100 ml warm water). I do not use any bread improver or bread softener. This bread needs to be consumed within 2 days as it tends to become dry after the second day. 1. 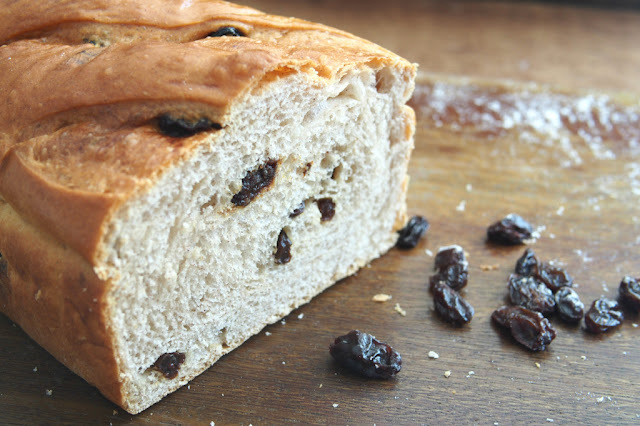 In a large bowl of a stand mixer, add all ingredients except raisins. Using the dough hook on a stand mixer, knead the dough until it comes together and is elastic. It takes approximately 10 minutes. If the dough is too wet, add 1 tablespoon of flour at a time. Half way kneading, add in the raisins. The reason I add raisins towards the end is so that the raisins will not get mashed in the mixer. 2. Cover dough with plastic wrap or a kitchen towel and let rise until doubled in a warm place about 45 minutes to 1 hour. 3. Once the dough has doubled in size, punch down the dough before turning out onto a lightly floured surface. Divide the dough into two balls. Roll out each ball with a rolling pin into rectangle shape. Roll up the dough until a log is formed, folding down the ends. Transfer the logs into bread pans lined with non stick baking paper. Cover with a kitchen towel and let rise for another 45 to 60 minutes until double in size. 4. Preheat oven to 350 degrees F (180 degrees C). 5. Bake for 35 to 40 minutes or until breads are golden brown. Remove from baking pan and cool on a rack before slicing and serving.